Today’s workout is not meant to be 21 minutes of hell. The running/rowing portions are a bit long on purpose as I want there to be enough “constant moving” opportunities to keep the heart rate moderate yet in control throughout. Choose a squat version and weight that will allow you to be relaxed and unbroken through for a majority of the workout. Add intensity anywhere you’d like to push it, however, just like any 21 minute workout, you’ll want to pace it to have some juice at the end. The reason for the different gymnastical beef versions is to put equal importance on each. While one might be more fun for you to do, which is completely fine if you always choose one, muscle ups are no better than pullups and vice versa. Keep working on both. Note that the second cardio portion can be done at any point after the buy-in but before time expires. I would finish it sooner rather than later, but for those of you who like to live on the edge and save it to the last minute, reference your row/run time trials for a gauge of how much time you think you’ll need. Rx’d: Buy in with 1000m/800m Row AND @ any point after the row: Run 800m. Static holds are the new in. Event though they’ve never been out. These will not only help develop strength in certain portions of gymnastics movements, they help develop endurance as well. Keep note of part B’s rest periods. The intention here is interval in nature; around a 2:1 work to rest ratio. The intensity should be higher than you would attack this workout with no rest. The score will be total time but doing some timing math at the end can give you some nice intel on how well you can managed all 7 rounds across the board. This week’s OLY session will have a little extra focus on the first pull using the halt on the first rep. The halt gives you an opportunity to improve positional awareness. The slight pause can also help you ensure that the legs are “on” during that bottom part of the lift. It’s key doing that halt to still mimic the speed on your regular none-halted ascents. Don’t simply lift it off the ground anyway you can just to get to the halt. It’s common in folks that rip the barbell off of the floor in bad position are typically not loaded and active down there. Think about staying tight in the upper portion of the body, and spread the floor with the whole foot before pulling the bar off the ground. Here is week 4 of squatting tempos. As I’ve alluded to in class, we are going stick with this for another couple of weeks so that you all are getting several opportunities to work these tempos and hopefully enough to build confidence and strength. The rotational ball slams are a way to develop lateral strength statically and dynamically. As humans, you can look at the foundational human movements as being squatting, hinging, pushing, pulling, and rotating. 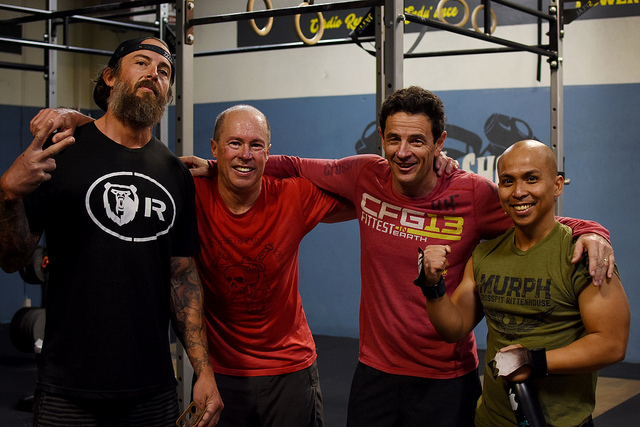 A missing weight that we believe is missing in the traditional CrossFit mainstream and competitive training is rotary work. Look to see more rotary work in the future. 25 minutes max for A1-A3. Use previous time trial information if you have it for today. Whether you are attempting to PR or simply looking to train these distances, go at these with some training intention. Maybe you try to push harder sooner or kick earlier, or maybe start things out less aggressive than previous times. Maybe you try to see if you can stick with a slightly more uneasy pace. As the coaches for help with selecting a pace for whatever your training goal is for today. 2k Row, 2k Ski, 1.5 Mile Run, 1 Mile Run, 5/4k Bike T.T.